Utah Department of Veterans and Military Affairs. Ten states have minimal and eight states have limited exemptions, while 16 states have full income tax exemptions. Nine states don't have an income tax. Rep. Lee Perry, a Republican from Box Elder County, wants to change that. Perry is sponsoring a bill that would exempt 100 percent of military retirement pay for service within the armed forces. Perry said he was contacted by one of his constituents asking him to present the issue in the form of a bill. The constituent told Perry the measure would only save him about $85, but added it would be an important gesture. "It means nothing to him for expenditure, but as a military veteran who has served our country and has protected our freedom it means 'My state does care what I did,'" Lee said in an interview with The Park Record. "It says thank you for your service and at times having your life jeopardized when in combat situations." It will be a "tough battle" fiscally for the bill to gain traction, Perry admitted. According to the VMA report, 16,280 military retirees receive an annual retirement pay of $375 million. A 100 percent exemption would cost the state nearly $6 million. However, Perry said that number may be closer to $16 million. "Right now it's not looking good," Perry said of the state's budget. "General funddollars don't seem to be as high as they have been in years past and there is not much wiggle room. Taking $16 million away could be a huge hit and cuts may have to come from somewhere to do it. That would be decision that would need to be made. "But the states that have done this have economically benefitted from it and have gotten military retirees to move to the state and they end up generating funds by purchasing cars and houses," Perry said. Utah currently has a 5 percent flat income tax that was adopted in 2008. When the rate was adopted it eliminated the state's previously enacted limited deduction, which allowed military retirees younger than 65 to exclude up to $4,800 and those 65 and older to exclude up to $7,500 in retirement income from taxes. According to the VMA, more than 19 percent of the state's population are military retirees compared with the national average of 7.6 percent. Seventy-one percent of the state's retirees are enlisted. "Do you know how many military retirees have emailed me and called me and said, 'I would love to move back, but one of those deciding factors is the exemption because we could just as easy go to Wyoming, Nevada or Texas,'" Lee said. Vietnam veteran Glenn Wright, of Park City, said the exemption is a "perfectly legitimate thing to do." While Wright doesn't receive a pension from the military, he said it is something that should be considered for those who do. For Hardin, the exemption would mean a savings of nearly $10,000 a year. However, Hardin said the monetary gain "means nothing." "But it will make me feel like, in a qualitative sense, that I've done something worthwhile," Hardin said. "It's something that I feel, having been a formerly enlisted man trying to live on a salary, I can speak with authority, because these people are at the bottom of the food chain. Asa guy who is 88, out of the army for 37 years, I would get a high degree of personal satisfaction from it as a retired general officer knowing the hardship they have gone through. It just feels like there is something that can be done." HB 99 is currently in the hands of the Utah Legislature's House Revenue and Taxation Committee. Perry said he hopes the bill makes it on the agenda sometime next week. For retired Lieutenant General Hal Hardin, thanking members of the military for their service appears to be more self-serving than genuine when it is coming from politicians in Utah. "Every politician now-a-days when he is about to interview someone on active duty always starts with, ‘Thank you for your service.’ It’s just something that automatically comes out," Hardin said. 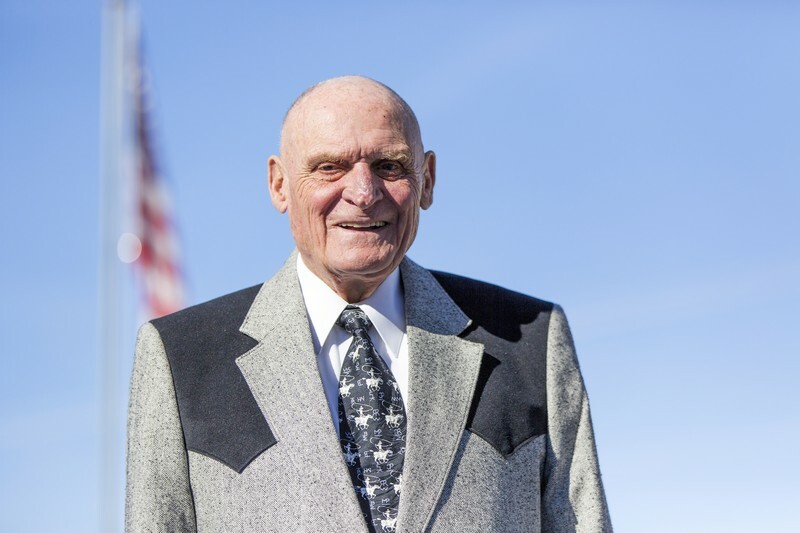 "But I really believe that Utah and its politicians can do better than ‘thank you for service.’"
The 88-year-old veteran and Coalville resident has become a strong advocate for a measure that would support state income tax exemptions for military retirees. Retirees are defined as veterans who are receiving compensation for services performed for 20 years or more. Hardin spent more than 33 years in the military, including 32 years in the active U.S. Army, serving in three wars. He is one of more than 16,000 military retirees paying income taxes in the state. Utah is one of seven states that do not have any form of a tax exemption for retiree pay. The other states are California, New Mexico, North Dakota, Rhode Island, Vermont and Virginia, according to an August report by the Utah Department of Veterans and Military Affairs. Ten states have minimal and eight states have limited exemptions, while 16 states have full income tax exemptions. Nine states don’t have an income tax. "It means nothing to him for expenditure, but as a military veteran who has served our country and has protected our freedom it means ‘My state does care what I did,’" Lee said in an interview with The Park Record. "It says thank you for your service and at times having your life jeopardized when in combat situations." "Right now it’s not looking good," Perry said of the state’s budget. "General funddollars don’t seem to be as high as they have been in years past and there is not much wiggle room. Taking $16 million away could be a huge hit and cuts may have to come from somewhere to do it. That would be decision that would need to be made. Utah currently has a 5 percent flat income tax that was adopted in 2008. When the rate was adopted it eliminated the state’s previously enacted limited deduction, which allowed military retirees younger than 65 to exclude up to $4,800 and those 65 and older to exclude up to $7,500 in retirement income from taxes. According to the VMA, more than 19 percent of the state’s population are military retirees compared with the national average of 7.6 percent. Seventy-one percent of the state’s retirees are enlisted. "Do you know how many military retirees have emailed me and called me and said, ‘I would love to move back, but one of those deciding factors is the exemption because we could just as easy go to Wyoming, Nevada or Texas,’" Lee said. Vietnam veteran Glenn Wright, of Park City, said the exemption is a "perfectly legitimate thing to do." While Wright doesn’t receive a pension from the military, he said it is something that should be considered for those who do. "But it will make me feel like, in a qualitative sense, that I’ve done something worthwhile," Hardin said. "It’s something that I feel, having been a formerly enlisted man trying to live on a salary, I can speak with authority, because these people are at the bottom of the food chain. Asa guy who is 88, out of the army for 37 years, I would get a high degree of personal satisfaction from it as a retired general officer knowing the hardship they have gone through. It just feels like there is something that can be done." HB 99 is currently in the hands of the Utah Legislature’s House Revenue and Taxation Committee. Perry said he hopes the bill makes it on the agenda sometime next week.